UPDATED: FEB 3, 2019 Barwa słomkowa, zamglone, a nawet mętne, że sporą ilością drożdży. Piana drobnopęcherzykowa, ale znika natychmiast całkowicie. W aromacie głównie kwaśność, trochę owocowości, nuty tropikalne i cytrusowe. W smaku kwaśne, cytrusowe, głównie cytrynowe, z wyraźnie ściągającym finiszem. Posmak trochę w klimacie kwaśnej oranżady. Spore wysycenie i dosyć spora pełnia. (on tap) Aroma: peaches, and sourness. Taste; semi-sour, flavor of peaches and passionfruit. Palate:medium body, medium carbonation, Overall: Very nice sour. Oranje-gele kleur met dikke witte schuimkraag. Geur is zoet, passievrucht en taart toetsen. Smaak is zoet, passievrucht, precies fruitsap. Naar het einde toe iets droger. UPDATED: JUN 19, 2018 0,33L bottle bought at the Bottle Shop Hong Kong. Appearance: Pours a hazy straw yellow colour with minimal bubbly white head, which dissipates fairly quickly and leaves very little lacings. Aroma: Smells like extremely fresh juice bomb, with very fragrant passionfruit, mango and pineapple with some peach and citrus. Light lactose and lemon, too. The passionfruit is particularly strong and dominant. Taste: Similar to the aroma. Moderate fruity sour, with passionfruit, mango, peach, orange and some additional gooseberry. Some light wheat, too. Palate: Tart and fruity finish with some very light lactose. Light to medium body, with fizzy and lively carbonation. Overall: Very juicy and fresh with prominent tropical fruit flavours. Balanced and has very high drinkability, especially in hot summer days. This Berliner Weisse has imitated the flavours of those sour gummy candy quite well with a twist of adding passionfruit as ingredients. And this makes the beer goes on my favourite list. A bottle of juicy candy paradise! A 330ml bottle with a best before date of 14th May 2019, ‘B4 vm’. Poured into a Lost Abbey teku glass. It was a hazy darkish orange colour with a just over one finger white head that dissipated and fizzed away loudly and quickly, while leaving no lacing. Aromas of strong tropical juice with lots of passionfruit, overripe mango and peach. Tastes tart, light to moderate sour, passionfruit, mango and lemon with some light wheat. Light bodied with high carbonation. Overall nice, tart and refreshing tropical flavours, especially passionfruit. Enjoyable and very easy to drink. UPDATED: APR 13, 2018 Pours pale hazy golden with virtually no head. Intense fruity aroma of passionfruit and grapefruit. Taste is initially fruity sweet as well, but sourness takes over eventually. Pineapple also traceable in the taste. Fizzy palate, tingles lively in the mouth. Soft, but short, sour finish. Easily drinkable, quite nicely balanced mixture of sweet and sour. Perfect for a warm summer day! UPDATED: APR 13, 2018 Bottle. Pours hazy straw yellow with a little white head. The aroma features a strong element of strong yeasty barnyard with some citrus fruits. Taste is much fresher and fruitier than the aroma suggested; pineapple, orange and mango. Also very sour, as expected. The palate is light to medium-bodied, average to lively in carbonation. Fresh and fruity despite the initial impression. Still does not quite fit into my palate. 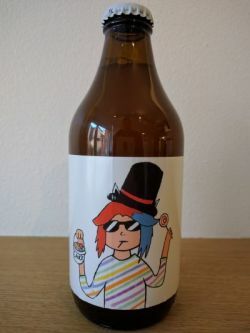 Berliner marakyjowy, kwaśny ten cukierek, niebrzydki w swim stylu, Brewskim chyba ostatnio berlinery lepiej wychodzą od ipek. Piwo na upał, nie na wieczny listopad. Hazy dark golden color, white head that quickly dissapears. Aroma has notes of lemon, lime and passion fruit. Flavor with light sourness, very fruity. Fruity final.